Oh! YAY! I'm glad you decided to play along, even if it's only sporadically. Great take on today's theme! that is one big nest - I didn't know that squirrels live in nests - cool photo! If I were you, I'd be a little afraid standing under that thing.. Welcome to the mayhem, Linda, I'm glad you decided to join us! You say sketchy like it's a bad thing. Truth is, I think just about everybody who's participating in 30 Days of Photographs III has questionable morals, not to mention marked mental-health issues. I question my own sanity, in fact, and so do I. Marvelous photo, Linda! The shot is really clear! I wouldn't stand directly under that thing. Squirrels just love my nuts. Birds, squirrels or something else's next? Anyway somebody lives here and it's safe and comfy high above. Be careful of the droppings! Cute picture! I don't like squirrels, but they do have interesting homes. That is one big nest thing. Is that really created by squirrels? I didn't know that squirrels built nests. You have awfully big squirrels where you live. Maybe it's nest of Sasquatch. I love the lighting in the shot. Nice! now i wonder what's inside. birds, no? squirrels. hmmm. Yeah, "over your head" might be dangerous. Love this photo and it's good to see you on the bandwagon. I'm not promising to chime in every day either. Consider yourself lucky. There are squirrelly things in my attic right now. Unfortunately, I can't seem to get a camera lens or rifle scope on them. As the resident expert on everything outside, I'm pretty sure that's just a big pile of dead leaves caught on branches. Then again, it could be anything except for a bird's nest. Or not. It could be a birds nest. If it's a bee hive though, I'd recommend running. As soon as I saw this, I thought of "Up" and went, "SQUIRREL!" Yeaaa! Meleah- Thanks! I'll be vacationing so we'll see how it goes. The Artful Diva- I don't know where they live, but they do build nests for their babies. Alexandra- As best I can tell it's a squirrel's nest. Thought I thought they ususallyt chose a taller tree. Ziva- Thanks, I'll be around as time permits. I think the inhabitants have move on by now. MikeWJ- I know the feeling from the 30 days of writing in June, but it was a blast anyway! Linda- Thank you! It is good to see you around here again. I've missed you. Coco- Thanks! It's probably safe now, though. laughingmom- Oh, they can be fun to watch, especially when they chase each other around the tree, or hang upside down in the pouring rain. 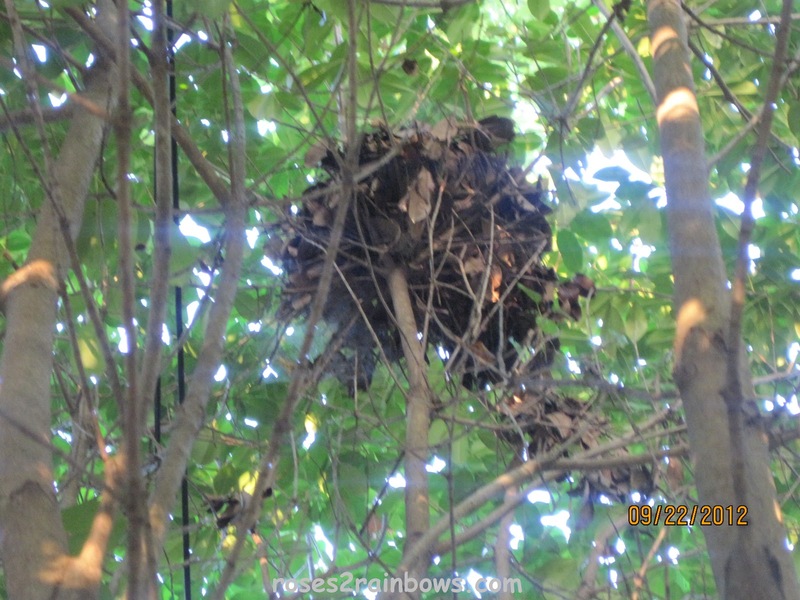 Cheryl- It looks like all the other squirrel nests I've seen, though they are usually higher up. Lauren- Thanks, I was directly underneath the nest. We just have average gray squirrels, but I'll be on the lookout for any that have morphed into Sasquatch. Margaret- I'll be in and out. Vacationing for a while so my online participation will be here and there. Jamie- Aw, don't shoot 'em. Nicky- It sounded like fun so we'll see how it goes. Cheryl- I really think it is a squirrel's nest. Not much way a bunch of leave would get caught there. But then again, I did not see them. Mike- If it were a beehive, I'd definitely be running. life in the mom lane- Thankfully - No. (see above comment). Katherine- Yep, a squirrel's nest as best as I can tell.